Simple to use – Everything is in one place and organized for easy access. Simple to access – Work anywhere with your desktop, tablet, laptop or smartphone. 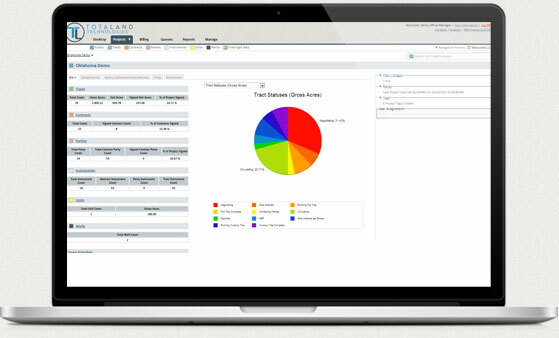 Reporting – Summary and detail data, filtering and sorting options and numerous exporting options. Executable Documents – Such as leases, rights-of-way and seismic permits. Payment Documents – Such as drafts, orders for payment and check requests. 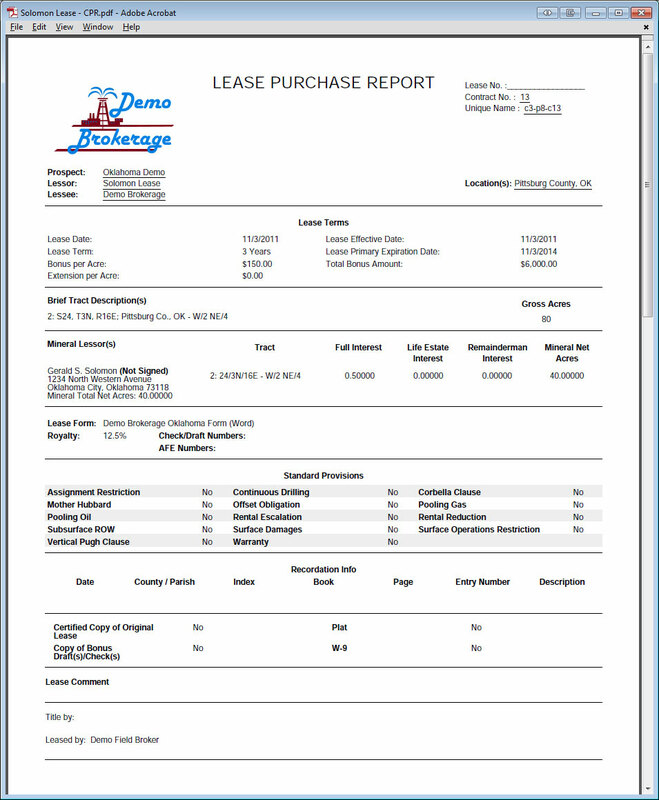 Purchase Reports – LPR’s and reports for a variety of other types of documents. Custom Output Libraries – Such as reports, lease and payment forms, additional paragraph language and provision tracking. Simple to deploy – No installation required and a rich library of video tutorials can be accessed anytime. World Class Support – Our support team knows field land work and is located right here in the USA. If you’re accustomed to working with existing tract-based and/or lease-based databases, get ready to be blown away. Our system eliminates the negative aspects of both tract-based and lease-based systems by using a unique, patent-pending table structure that eliminates the need for repeated data. This allows you to quickly find and access only the information you really need. Our patent-pending Abstract Assembler takes the instrument records contained in a project and gives you the ability to compile those instruments into a secure PDF file for printing and binding or forwarding directly to a title attorney for examination. The completed abstract file will include a cover sheet with the brokerage logo, a caption page, a table of contents, an index with page numbering done automatically and miscellaneous images such as disclaimers and tax certificates. Broker and client billing is a tedious reality of our business, leading to slow processing, unnecessary overhead, and even missed billing opportunities. 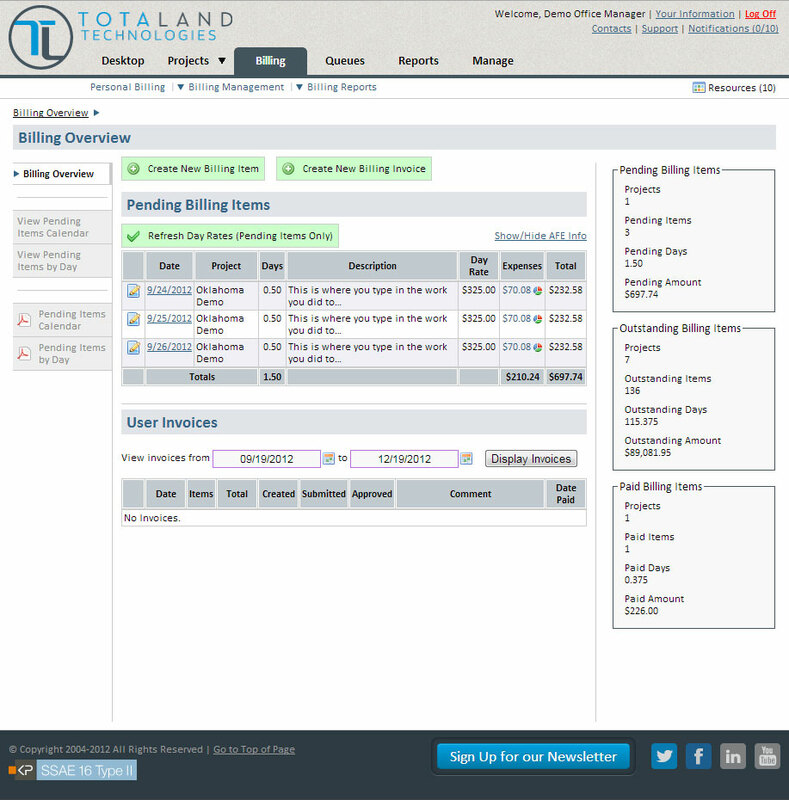 With TotaLand, brokers can do their billing in a snap. 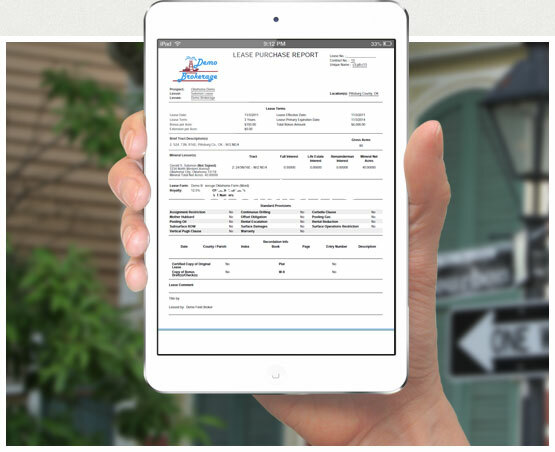 They can quickly complete daily billing items, attach scans of receipts if necessary and submit their invoices online. 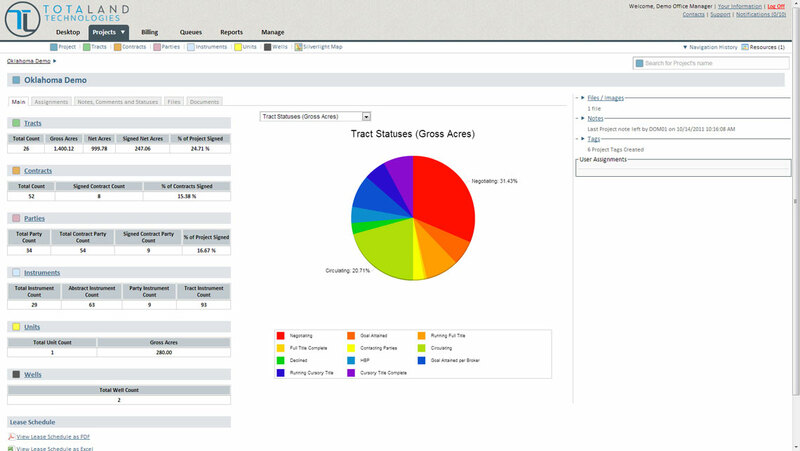 Broker billing data can optionally be processed into client invoices as well. You’ll be amazed at how much time TotaLand saves. In TotaLand, “contract” refers to OGMLs, seismic permits, pipeline rights-of-way and similar documents. From a data standpoint, a contract contains critical information such as effective and expiration dates, type of form, dollar amounts per acre or rod, etc. With TotaLand, contracts are linked to tracts and parties as necessary, and even to instruments, units and wells. After your information is entered and linked, you’re just a click away from creating a PDF document that can be printed, executed and shared. Since the document was generated from your data, the LPR or other form of contract report can be generated instantly as well. 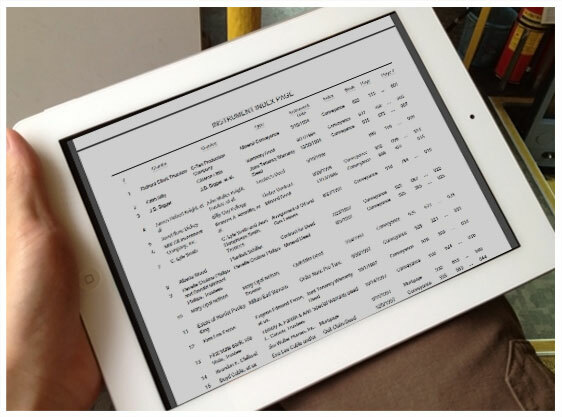 You can even provide your client with data and images related to your project(s) with ease. One of the most powerful features of TotaLand is the ability to provide an online version of project maps. TotaLand links maps to your project’s data, and a map’s symbology can then be controlled by that data. For example, colors and hatches of tracts are updated automatically based on the status of the tract or objects attached. 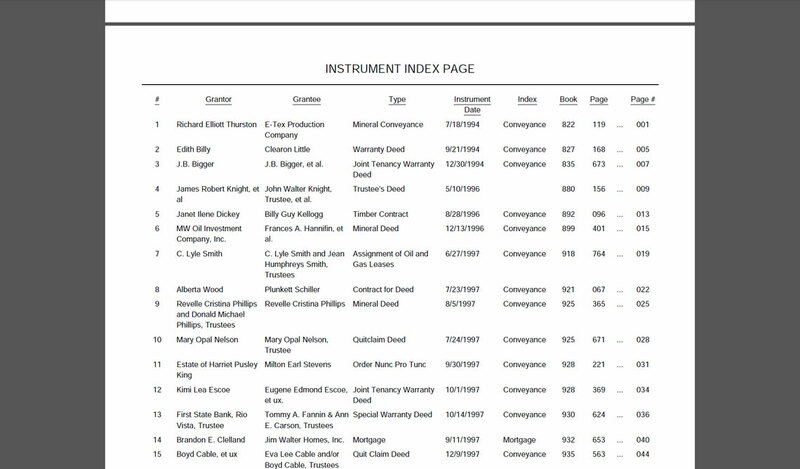 And our unique table structure allows you to access information about anything attached to the tract – such as parties, contracts, images, statistics, etc. – all through the online map. 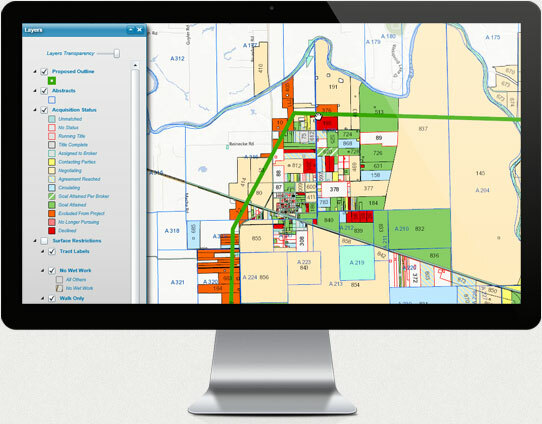 If you’re already familiar with how GIS layers function, get ready for a game changer. TotaLand creates multiple dynamic layers that are each symbolized with information relevant to that particular layer. Each base map is built specifically to suit your needs, and once a polygon is built and linked, it never has to be addressed again unless its shape changes. For base maps and polygon maintenance, TotaLand personnel can receive the requests and build the polygons for you, or you can manage your own polygons via a secure FTP connection to your map directory. We don’t measure our support by how many user questions we answer. Instead, we focus on how few times our users feel the need to ask a question--and that focus has paid off. We begin with an intuitive interface that only we can offer. We go on to provide our users with numerous avenues for both self-training and quick reference. For example, our users can avail themselves of our video tutorials, interactive user guide, page-related and topic-related help resources. Ever have the need to generate data-specific plat maps? We have you covered. 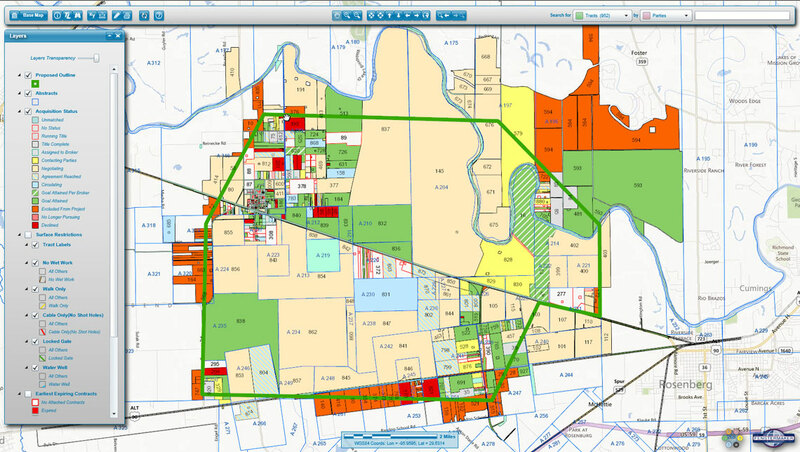 Since TotaLand is linked directly to the corresponding GIS map, it can communicate with the GIS server to zoom, center and highlight tracts and create a map for that particular request. Common requests for exhibit plats and contract packet plats can be managed and delivered right through the website, saving a tremendous amount of time and money. Other systems use a per-user charge to determine the license cost, which leads to unpredictable and excessive monthly costs over time. Your finance department will be ecstatic. Data encryption, automatic backups, physical security, redundant power and 60+ million hits without a single security lapse or incident of data loss—you can be certain that your data is secure and available when you need it. We know how important confidentiality is in land work. We never mention who our clients are without their specific authorization. Since we do not perform brokerage services, you don’t have to worry about any potential conflicts. 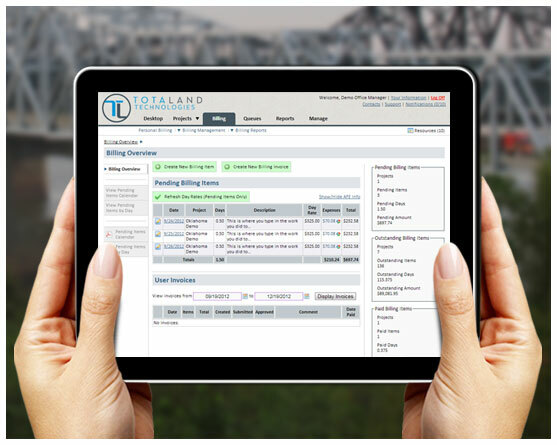 Over the years, our clients have used TotaLand for a wide variety of project types. We are more than just a software company. Our personnel know the language and what you need from us.